Friday, March 11, 2016 - Paris-Nice as an appetizer for upcoming Tour de France. 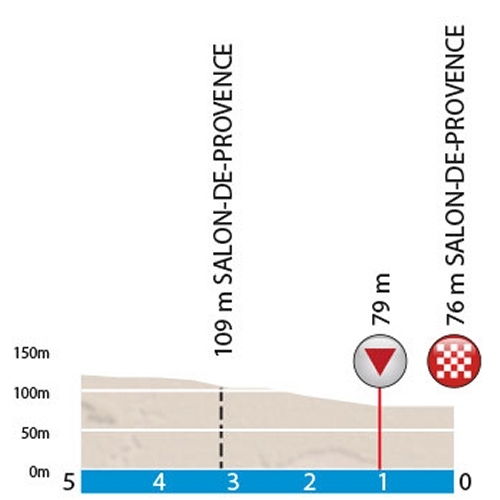 In stage 5 the riders face a Mont Ventoux-light climb in a 198 kilometres endeavour leading from Saint-Paul-Trois-Châteaux to Salon-de-Provence. On rolling roads the pack races to Col de la Madeleine, a 3rd category climb that is to be crested with 50 kilometres done (and is not to be confused with the famous pass in the Alps). After a 6.5 kilometres drop the riders are in Bedoin, the starting point of a plurarity of notorious Mont Ventoux-climbs in cycling history. Unlike in the upcoming Tour de France today’s finish is not at the top. Far from it, at Chalet Reynard the riders turn right and still face 126.5 kilometres to the finish line in Salon-de-Provence. Since the characterristic lunar landscape begins just after Chalet Reynard Paris-Nice offers a Ventoux-light climb. Yet its far from a joke as the road through the forest has 9.5 kilometres at 9.3% on offer, while the highest point of Paris-Nice is reached in Charlet Reynard at 1,435 metres. Shortly after the right-turn a 20 kilometres drop welcomes the riders. Once in the valley the non-categorized climb to Saint-Jean-de-Sault brings them to an elevation of 823 metres. After yet another long descent the riders are to digest three climbs in the last 80 kilometres, but they will not again rise to over 500 metres. Col du Pointu (5.9 kilometres at 4.1%) is crested with 131 kilometres done, Côte de la Roque d’Anthéron (4.2 kilometres at 5,5%) with 162 kilometres done, while Col de Séze (1.7 kilometre at 7.2%) is history after 169.5 kilometres in the saddle. The final 30 kilometres are flat with the ultimate kilometres going slightly down, predicting a high speed finale of the Vendoux-stage in Paris-Nice 2016. Race results/race report stage 5, Paris-Nice 2016.